I totally should have posted this at 11:11:11 a.m. , but I was too busy preparing to go jump into the freezing cold ocean. 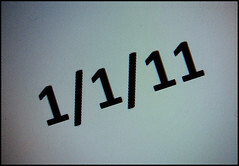 So I’m posting it at 11:11:11 p.m. instead, because that is the way I roll. Image Credit: Posted by kiwinz on Flickr. 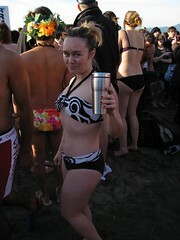 Me, with a cup of tea, preparing to go for a very cold swim! So one of the things on my 101 things to do in 1001 days list was to do the Polar Bear Swim. For the uninitiated, The Polar Bear Swim is where you go for a chilly swim in the ocean (or a lake or some other outdoor body of water) on New Year’s Day1. The Polar Bear Swim in Vancouver is held in English Bay and has been going since 1920! Since my 1001 days are up in October, today was my last chance to knock this item off of my list. And knock it off the list I did! I originally got the idea to do the swim earlier in the year and when I tweeted about it, my friend Krista said she’d swim with me. In the ensuing months, however, Krista became preggers and so offered up her husband to join me in her place. Unfortunately, the two of them came down with the flu this week, so jumping into freezing cold water was out of the question for Ryan! I saw on Twitter that my friend Lianna was planning to do the swim, so I arranged to swim with her, but then she emailed me this morning to say she was too hungover! Not one to be discouraged by such things, I decided that I’d just swim by myself2! And it wasn’t like I was totally by myself – there were thousands of people there and I had my “support team” of Kalev and Craig! As for the swim itself, despite the fact that it was really cold today, the water wasn’t *that* bad. This was probably because I was in excruciating pain from standing on the very, very cold sand in my bare feet! Like so-cold-it-feels-like-your feet-are-being-stabbed-with-a-thousand-knives cold. Running into the water was a bit of a relief, to be quite honest! I decided beforehand that I was going to go into the water up to my neck, but not dunk my head. Because having wet hair when it’s only 2 degrees out seemed like a terrible idea. I mean, even more terrible than the idea of going into the ocean when it’s only 2 degrees out. I ended up chatting with some other folks who were nearby and ran into the water with them, but as soon as I got up to my neck in water, I ran back out as quickly as I could! 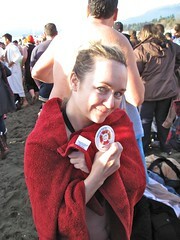 And here’s a much better pic of me, wrapped up in my towel and showing off the button that you get for doing the Swim! Fortunately, Craig lives in the West End, and Kalev and I had stayed at Craig’s after his New Year’s Eve party last night, so it wasn’t too far to go from the swim to jump in a nice a hot shower! Craig has a super swanky shower, with TWO shower heads, so that totally made me feel better despite the fact that my nearly frostbitten feet were burning in the hot shower water. When I decided to do the swim, I thought “this is a once-in-a-lifetime kind of thing.” Like the kind of thing where I can say I’ve done it. But now that I’ve done it, I’m thinking I could see myself doing it again next year!